Memory manufacturer G.Skill took humble computer memory to a whole different style level with the release of Trident Z Royal. 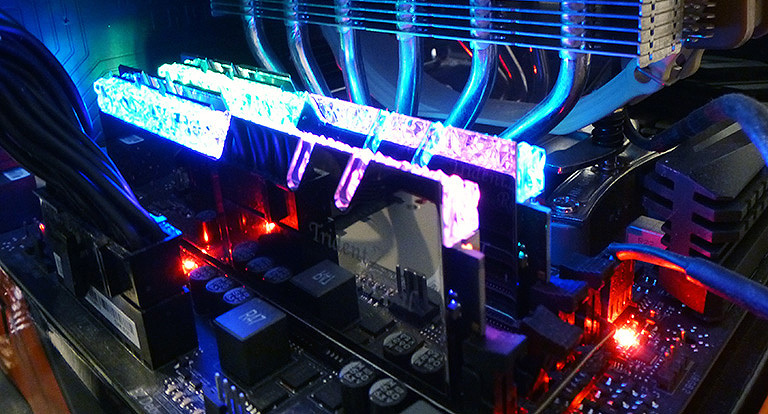 Updating its regular Trident Z through gold or silver heatspreaders with a mirror finish, the RGB element spans what the company calls a crystalline light bar. 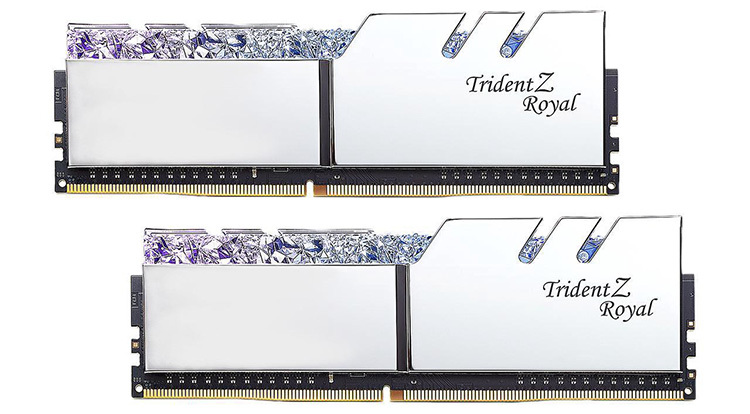 The overall effect is much like Marmite: you either love it or wonder what the fuss is about, but there's little denying the underlying DDR4 memory, which is available with speeds between 3,000MHz and 4,800MHz in a dizzying array of timings and capacities. Equipped with 18-22-22-45-2T timings, we'd describe the pack as middle-of-the-road as far as enthusiast models go. The qualified vendor list (QVL) for this speed is frighteningly small for AMD motherboards. In fact, only four make the official cut - three from Asus, one from MSI - compared to a litany of compatible boards on the Intel LGA1151 platform. That's not to say these sticks won't work on your Ryzen setup, it's merely G.Skill covering its back. To that end, we're using the MSI X470 Gaming M7 AC for testing. The chrome-plated finish in silver looks, in our opinion, way better than the gold that we took a gander at recently, and it contrasts well against the plastic crystalline light bar. Be aware the heatspreaders are a veritable fingerprint magnet, so it's handy a cleaning microfibre cloth is bundled. As with the regular Trident, these modules are big, standing at 44mm tall, and it would make sense to pair them with an all-in-one liquid cooler for maximum light exposure. 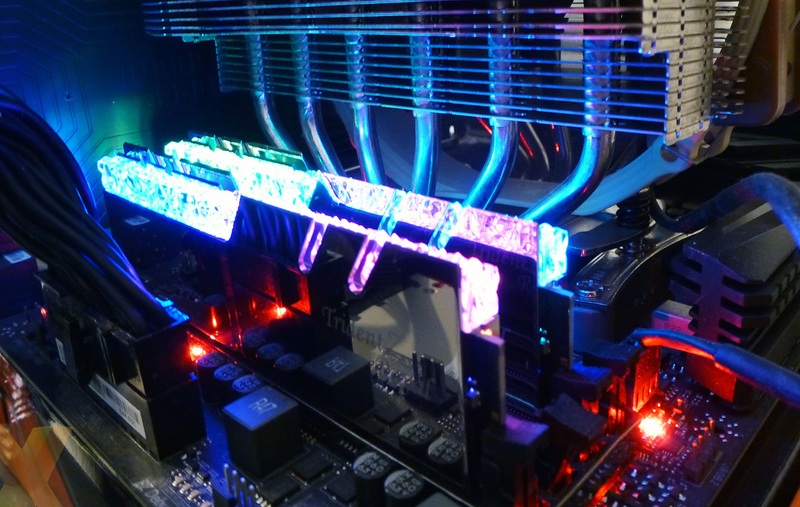 Sticking them under a large Noctua DH-14, for example, causes the light to bounce around off its silver finish. Running the full length of the module by having a flattened s-shaped section in the middle, the light bar is see-through, though you cannot readily view the RGB LEDs because they are contained lower down on the 10-layer PCB. Overall, build quality is sound. 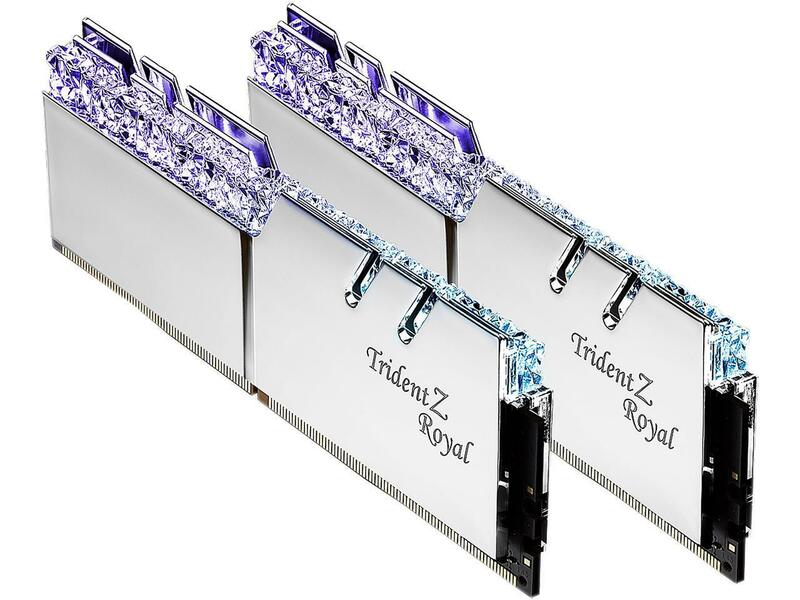 The Trident Z design has been in the market for some time now while the crystal light bar is firmly attached to the top. Let's cut to the chase. What you're essentially paying for is the look and visuals provided by the Royal line. 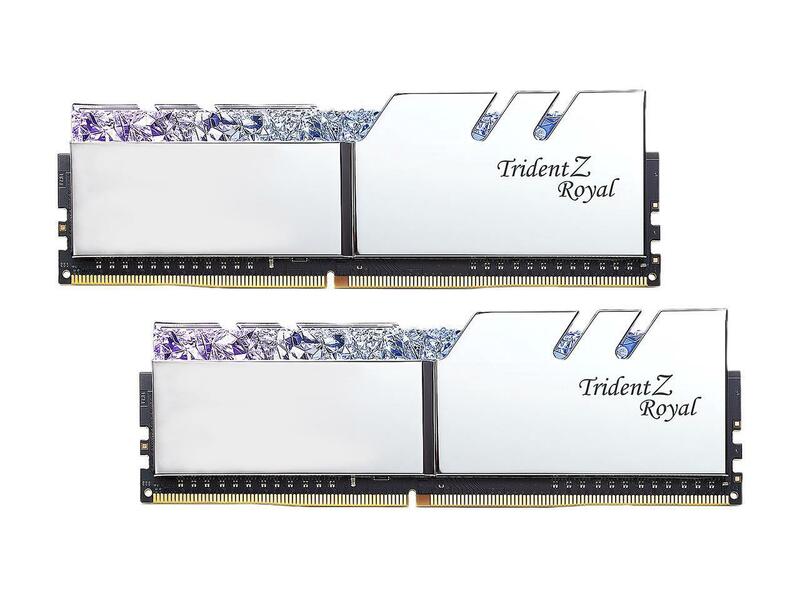 This 16GB pack retails for around £200, which, we note, is more than twice as much as vanilla DDR4-2667 of the same capacity (£90), but in the same ballpark as other DDR4-3600 RAM from the usual vendors. The price for going fast is painfully obvious, but matters less in instance where the total build cost is, say, £2,000. Every edge of the Trident heatspreader is pretty sharp, so much so that you don't want to be pushing the modules into their retaining slots with the fleshy part of your fingertips. Rather, the best way is to push down on the light bar until the familiar locking click. DDR4 ICs balance speed versus latency, and having 3,600MHz memory with what we'd describe as loose latencies won't give you massive boosts in real-world tests. We'll let the benchmarks highlight the differences.